BEFORE: It’s the last day of the Coen brothers chain (which also means it’s the last day before The Matrix triology viewing) and that means it’s time for No Country for Old Men. This is yet another film I’ve seen but given the surprising result of rewatching The Big Lebowski yesterday (read: not as good as I remembered), I’m very interested in seeing No Country for Old Men a second time. Starring Tommy Lee Jones (last seen in Captain America: The First Avenger) and more importantly, Javier Bardem (last seen in Skyfall as yet another great villain). AFTER: My memory of No Country for Old Men was spot on because it was just as good, if not better watching it a second time. One of the reasons I like this film so much is the Coen brother’s use of the show-don’t-tell rule in filmmaking. This rule, more of a guideline really, forces filmmakers to take advantage of film being a visual medium first and foremost. If it is a really good film it can be understood based solely on what is shown with no dialogue or exposition. A secondary effect of this is using sound in different and unique ways. In No Country for Old Men there are large chunks that feature no dialogue, no talking, no noise of any kind besides ambient sounds of the environment. Even in parts where there are character’s voices, music is lacking throughout much of the film. And yet, No Country for Old Men has some of the most clear, straightforward, and suspenseful scenes ever. There are many wide and point of view shots which lend to the clarity of the scenes. The Coen brothers make it clear through the characters eyes what’s going on in the scene, almost as if your reading their minds rather than listening to them speak. And in many cases this absence of sound adds to the suspense and make the things that are said much more impactful than they normally would be. Besides the beautiful and effective cinematography by Roger Deakins (who also shot Skyfall by the way) there is some phenomenal acting. There is not a rotten apple in the bunch, but the best performance is far and away Javier Bardem’s character, Anton Chigurh (not pronounced like sugar). Bardem, who won the Best Supporting Actor Academy Award, just has a look and an aurora about him that is just creepy. Combined with his unique killing machine I consider Chigurh to be one of the best villains in recent years. No Country for Old Men is definitely my favorite Coen brothers film. The way I describe it may make it sound boring (little dialogue, long periods of almost no noise) but the two hour runtime just flies by which is a sign of a good film. When you become so engrossed in the story and what’s being shown on the screen that your sense of time becomes distorted you know that’s some quality entertainment. 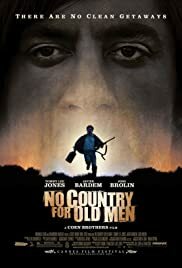 I would recommend watching No Country for Old Men regardless, but if your a fan of Westerns, the Coen brothers, or even just suspenseful dramas, this film is especially for you.